Prototype: To increase the traction of the best A-F7 locomotives developed by General Motors Electro Motive Division (EMD) an F7 diesel locomotive without cab. These “B-Unit” could be coupled to one or more F7-A-Loks. 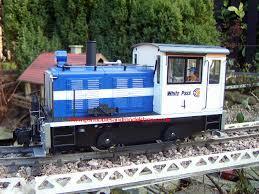 All locomotives could be operated by a driver in the cab of the “A-Unit”. Model: This non-driven model of an F7 B-Unit “of the railroad company Atchison, Topeka & Santa Fe Railway (AT & SF) is the famous LGB digital sound facilities. You hear about the built-in speakers, the gradual synchronized diesel engine noise, stationary noise at idle (up to 30 seconds), the bell, the horn and brake noise. Additional sound features can be controlled via the LGB Mehrzugsystem. Reliable multi-sockets for flat pin are installed. Length: 600 mm, Weight: 2100 g. The model is only for use with LGB-F7-A-capable models. To form a prototypical AB or ABA entity the matching A and 20,576 units will be offered 20577th Features.